To celebrate the tenth anniversary of the release of the dark comedy, Throg, Stacey Longo caught up with director Matthew T. Power to discuss the ins and outs of what is arguably his masterpiece. SL: Matt, thank you so much for taking the time to talk to me. I think the first thing our Throg fans will want to know is, how did Throg come to be? MTP: At a local indie film screening we actually showed a three-minute pilot scene of Throg walking into the Sword in the Stone scene in the woods, pulling the sword out and the stone, tossing the sword away and walking off with the stone. The audience went NUTS. So we (perhaps crazily) said . . . Throg needs to be a movie! SL: Had you directed or acted in anything prior to Throg? MTP: Well, I had directed a few plays in college, and done a lot of acting. I trained at National Shakespeare Conservatory and the University of Maine, got my degree in theater . . . and my dad is a theater professor/director who was actually pals with Kurt Vonnegut. Tony Shalhoub was one of his acting students, too. I still do acting now and then—usually Shakespeare—I played Caliban in The Tempest at the Freeport Shakespeare Festival a couple of years ago, then Sir Andrew Aguecheek in Twelfth Night a year later. Recently I played the lead in an Irish stage drama called Someone to Watch Over Me. SL: Well, that explains the Shakespearean undertones in Throg! You were able to get some fabulous actors for this film—Dana Lee, Stephanie Hughes, Dale Phillips, and your own performance as the Fool were among my favorites. Where did you find your cast? MTP: Some were just old friends like Dana and Dale, who had done medieval reenactment with me for years … others were people I met in theater school, and others were anyone we could get to wear a pig suit! My friend Dennis Green — Urshag the Destroyer, the big villain — passed away this year. He was a gentle giant and we really miss him … so gentle that we sometimes had a hard time getting him to be “scary” in the part. SL: That’s terrible news, and I’m sorry to hear it. Urshag was certainly a memorable part! Watching the movie, one gets the sense that you were all having a lot of fun filming Throg. What was shooting like? MTP: Well, it took us four years to shoot it, mostly on weekends, and it was often fun and we laughed a lot, though it was also very exhausting. We had no crew really, so a handful of us: Melissa Ross, Lori Power, Wayne Woodbury and myself, had to lug lights, gear, costumes and so on everywhere we went and that started to wear after about the third year. For the last shoot, we rented an airplane to shoot Throg on that island getting hit by bird crap and we “missed” when we tossed the bird crap, and had to crawl on hands & knees scraping it out. That was the last straw for some of our poor crew—we needed it to end! SL: What was the budget for this fine movie? MTP: We paid the whole thing out of pocket, probably a total of about $35k over the whole period, which I attribute to my being in film school. We spread out the pain, in other words. SL: Tell us about the Boston International Film award you won for Throg. MTP: The award we won was for Best Cinematography, and I think it was in 2004. The movie also showed at the Magic Film Festival in Maine and the Rome International Film Festival in Georgia. We sort of annoyed all the “serious” filmmakers at that last one, because Throg got a huge front page write-up in the local paper, and I kind of agree with [the other filmmakers] that the films they had there were probably more important socially and, well, just better. But I did get a laugh out of some of the curves that Throg’s very short-lived popularity threw at us. I always looked at the movie as an in-house experiment, not something I’d want to show off to the world . . . I don’t take criticism or praise too seriously; that’s a good way to lose your creative drive. 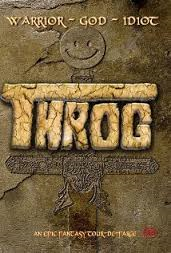 SL: I think Throg fans everywhere are dying to know: are there any plans for a sequel? MTP: Not to the film, but I’m really interested in making an interactive graphic comic that could include clips from the movie as a special bonus . . . and I think the Throg character could continue to have many adventures and maybe eventually his own web video series of shorts. SL: Where can people go to learn more about you/your company/the movie? MTP: Well, right now I don’t have a Throg website or anything up that tells much about the film. I have done a lot of other short videos since then, including a comedy that won Best Comedy at the Phoenix Film Festival, if people want to see other stuff I’ve done post-Throg. SL: Well, Matt, thank you so much for taking the time to talk with us today. We look forward to seeing your next endeavors, especially if they’re as enjoyable as Throg!